Invasive alien plants are non-native plants that come from somewhere else (usually from other continents), were introduced purposely or accidentally, are established in nature (they reproduce naturally in the wild), and are able to efficiently disperse at cost of native species. They contribute worldwide to biodiversity reduction, and according to IUCN, they are indeed the second most important cause for the current global species decline, after habitat destruction by humans. According to art 8 h) of the Convention on Biological Diversity, introduction of such species should be forbidden, and already established species should be controlled or eradicated. Many international and national organizations and institutions in Europe deal with this subject, and inform about the species and consequences and about the measures and actions to take. See these useful links. In Switzerland, invasive neophytes have also become a threat for biodiversity in the last years. Therefore, there has been a tremendous increase in the number of activities on this topic, ranging from knowledge transfer and awareness raising to containment and control. Thanks to the new and updated Release Ordinance (FrSV), in force since October 2008, Switzerland possesses a legal basis to protect humans and the environment from damage caused by the handling of invasive alien species. 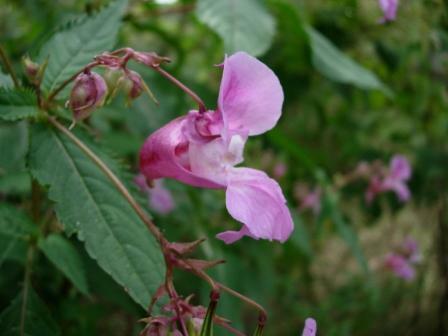 The Himalayan balsam rapidly colonizes places along waters, here in Yvonnand, VD. Not all neophytes are invasive. About 500 to 600 neophytes are currently included in the Swiss flora, of which 58 are considered invasive or potentially invasive. Native species can also become locally massively abundant and undesired (for example, creeping thistle, stinking willie, hoary ragwort, broad-leaved dock, etc.). PHP: 0.0193 s, total: 0.0208 s, document retrieved from cache.